Most of us love white bathrooms because we relate the white color to a clean and sanitized bathroom. This is a complete misconception! They do sleek and elegant. But hey! Don’t you get bored when you look at the same ‘overpowering’ white? Or maybe you hate neutral colors because they do not motivate you enough? You do, right? So, why not add some colors which can brighten up your mood every morning and relax you as well at the end of the day? It will add a vibrant vibe to your house without you paying a hefty amount of money. You might think that using colors look tacky in such a small space. And that is where your thinking goes wrong. It is easier to play with colors there because then you know that you can’t go overboard. Believe it or not but some people consider their bathrooms to be the most fun places in their entire houses. It’s time for you to get inspired too. Here, we are presenting 8 simple ways in which you can splash your bathroom into colors. Also, make it look very classy and well-organized. It is quite obvious that the thought of pouring colors on your entire bathroom seems crazy to you. In that case, you can choose that one ‘wall’ and make it your blank canvas. You can paint the wall in a bold and bright color and make it the focal point. Using a single color might look like a great idea. But monochromes, patterns, and wallpapers are very much in trend these days. They make the space classy without a hint of boredom in it. In a mood to experiment some more? Artistic wall panels and architectural wall panels are the best things you can incorporate in your bathroom. Decorative gypsum wall panels are available online and in your local markets too. And relax! They aren’t expensive at all. You can get cheap wall paneling done at cheap rates. Feels like the bathtubs have not changed since eternity. Always the same old white bathtubs. We are so done with them now! They need a makeover. If you are still obsessed with your white bathroom and don’t seem to get over it any time soon, it is okay, pal. We have something for you in store. Use a shaded tub in your bathroom. In that way, you are making an impact without changing much. Choose a color which makes you happy. It can be anything from blue or pink to gold or copper. Make sure you can live with that hue for a long time to come. 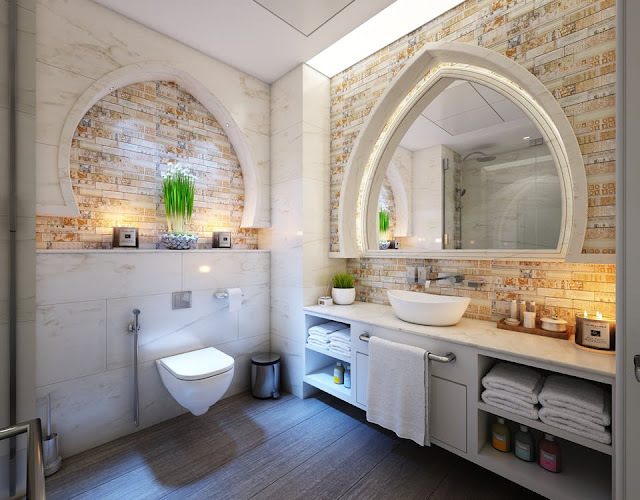 Are you thinking of using tiles all over your bathroom? Please, don’t. Those days are long gone, my friend. The time is all about throwing light on that one point where you want to draw everyone’s attention. If you are going for tiles, it means that you want something permanent. A small part lined with tiles or a mosaic wall looks very pretty. There are tons of options before you. Sounds expensive? Tile paint is a cheap option out there for people on a tight budget. They look attractive and you can go for them without any second thought. I’m sure everybody has that one color which is his/her absolute favorite from ages. So, why not add a statement piece of furniture of the exact same color in your bathroom? If you are blessed with a huge bathroom, you can fit a cabinet in there or paint your old one in your favorite shade. Vanities look uber cool. They can make the area look posh. Don’t be sad if you have a smaller bathroom. Chairs and tools look beautiful too. Don’t ever forget to make your furniture waterproof or else your hard work can get ruined. Metallic finish is ruling the world. From lipsticks to homeware, they are everywhere. Why do our bathrooms lag behind then? If you like to change its look quite often, then investing in something permanent might be disastrous. Hence, use small pieces made out of metal like a tray, mirror, or a soap dispenser. You can get anything in metal according to your liking. Rose gold color needs no introduction. Remember not to overdo it. Curtains are available in the market in each and every color possible. They are inexpensive and not a big-time investment. You can swap them whenever you want according to your mood or the season. They have the capability to make a tired looking bathroom all freshened up. You can literally feel the conversion from drab to fab. Buy waterproof fabric if your bathroom lacks proper ventilation. Get rid of the misconception that your bathroom does not need accessories. This is a very easy and affordable way of adding personality to your bathroom. Buy statement accessories which can be fixed on the wall or can stand on their own. Small items like candles, towels, and soaps or something as big like a basket or flower vase, it can be anything. You can add them like a contrasting feature to your bathroom wall. There is no color better than the color of nature. They can make your bathroom look effortlessly beautiful without burning a hole in your pocket. Go for a flower in the color which attracts you the most. If you want to add some fragrance without paying anything, you can place orchids or lilies by your basin or bathtub. A real plant can be quite difficult to maintain, so in that case, you can buy good artificial flowers. They need very less maintenance and give the same effect as any real plant. It is advisable to not go wild while giving a makeover to your bathroom. Just a dash of your favorite color and your pamper zone will look better than ever.